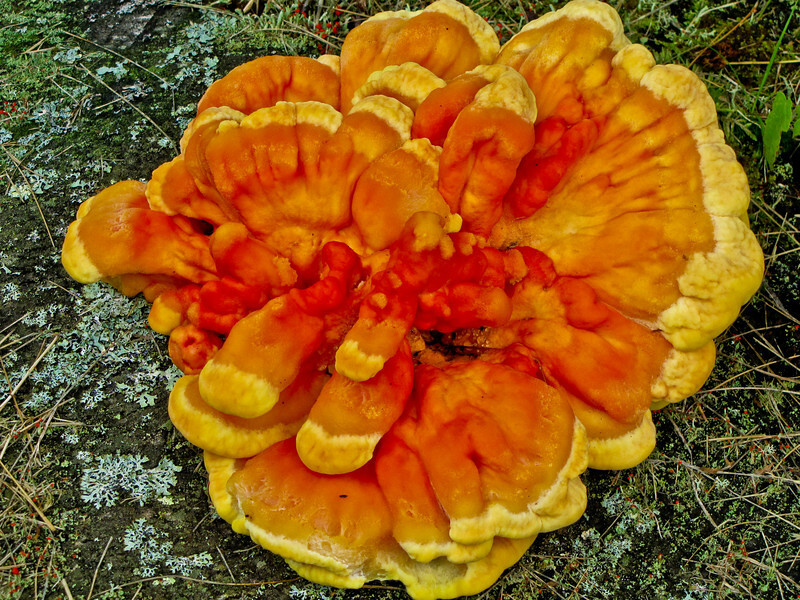 I found this growing on a stump on the University of Maine at Machias campus and I must admit I have never seen anything remotely like it. Well, maybe remotely. 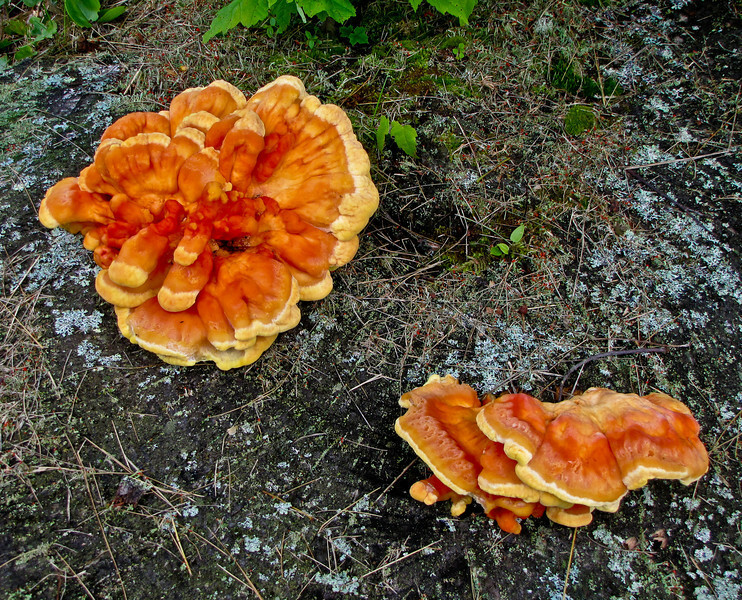 And I certainly don’t know enough about fungus to even begin to identify it precisely. The shot below gives you some scale if you note the pine needles. Clearly the low angle shot is for effect and I forgive you if your response is “what IS that?” It does kind of defy the eye and mind to make sense out of it. Thing is, even when from above, in more normal presentation it is still pretty fantastical. I suspect the smaller fungi on the right is the way it is supposed to look. 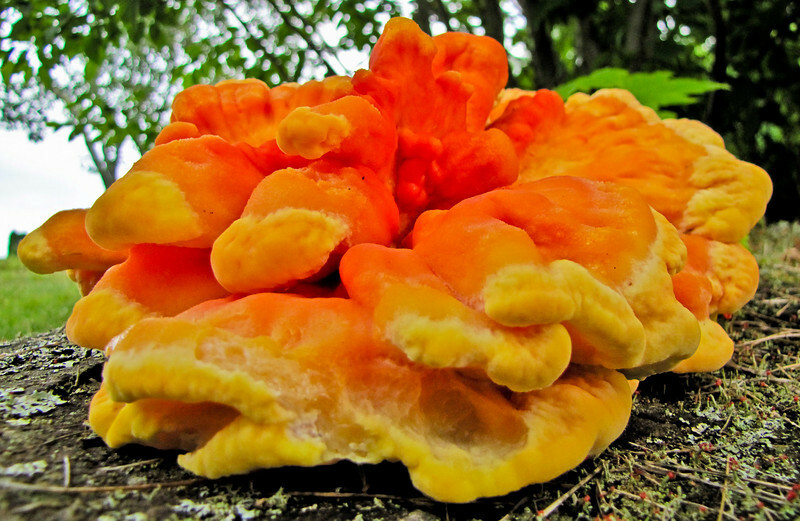 But who knows…it is a fungus. Canon SX20IS at various focal lengths for framing. First shot at Super-macro. All on Programmed auto, –1/3EV exposure compensation. While it looks like I pumped up the Vibrance or Saturation in Lightroom, honest, I did not not. That orange is real. I did move the Blackpoint right slightly and add Clarity. Sharpen narrow edges preset. 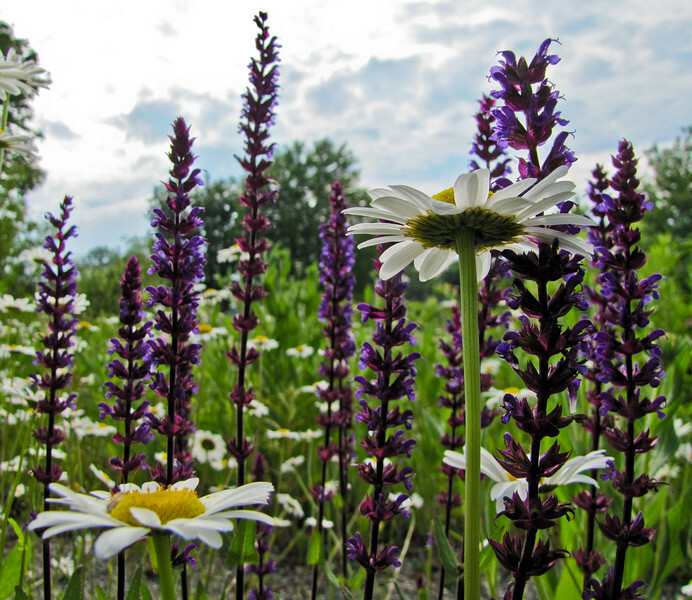 You may have noticed that I had lots of fun in the overgrown flower maze at the University of Maine at Machias…but I promise this is the last set from there (for now). 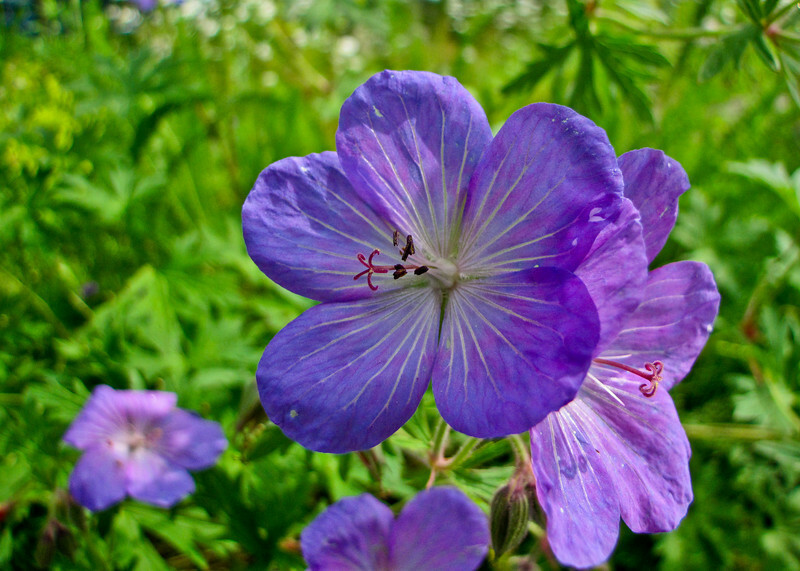 The delicate blues and purples of this bloom, highlighted in the sun, are what caught my eye of course. Canon SX20IS at 28mm and Super-macro. F2.8 @ 1/1000th @ ISO 200. Programmed auto. And this one, not in as full light, and from a lower angle to put it in context. Cropped slightly for composition. F2.8 @ 1/1250th @ ISO 80. Programmed Auto. –1.3 EV exposure compensation. I could almost build a preset for Lightroom. A touch of Recovery for the highlights. Fill Light (more on the second shot) and Blackpoint just barely right. Added Clarity and just a bit of Vibrance. Sharpen narrow edges preset. The reason I don’t build a preset is the Blackpoint adjustment, which must be carefully gauged for each image. The top image showed considerable purple fringing along the out of focus flower edge on the right. I was able to remove some of it in Lightroom. 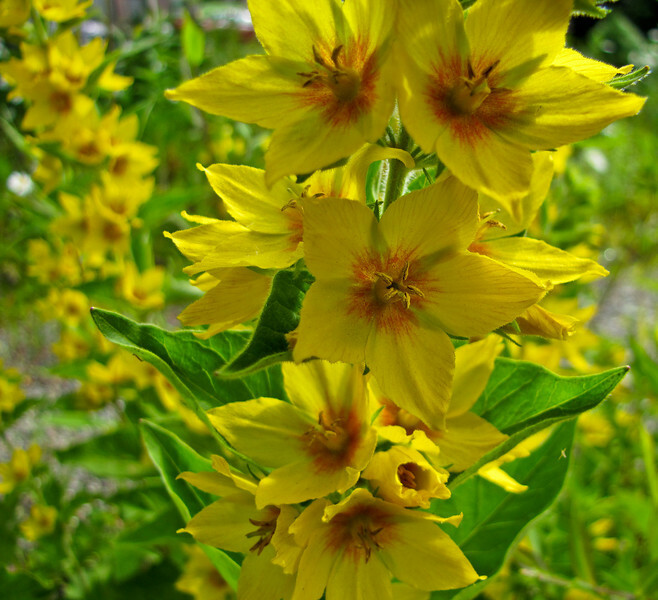 It took me 30 minutes to find this yellow flower on the internet…for some reason it has escaped my notice until now…until I found masses of it growing in the overgrown flower maze at the University of Maine at Machias. 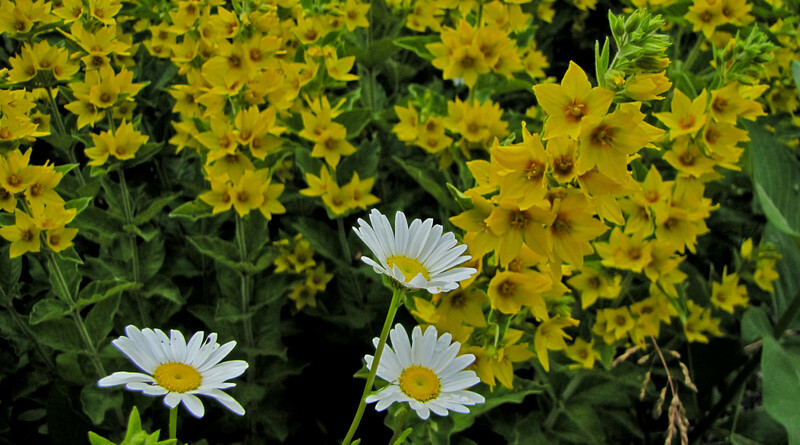 In the top image, the Loosestrife forms a backdrop for the small cluster of Daisies. The second is, of course, an uncompromising portrait of the the blossoms taken in Super-macro mode with the lens hood touching the flowers at the top. Canon SX20IS at Macro and Super-macro and 28mm equivalent. 1) F2.8 @ 1/1250th @ ISO 160, 2) f2.8 @ 1/400 @ ISO 80. Programmed auto. –1 EV exposure compensation. In Lightroom 3, Recovery for highlights, added Fill Light and Blackpoint just to the right. Added Clarity and very little Vibrance, Sharpen narrow edges preset. 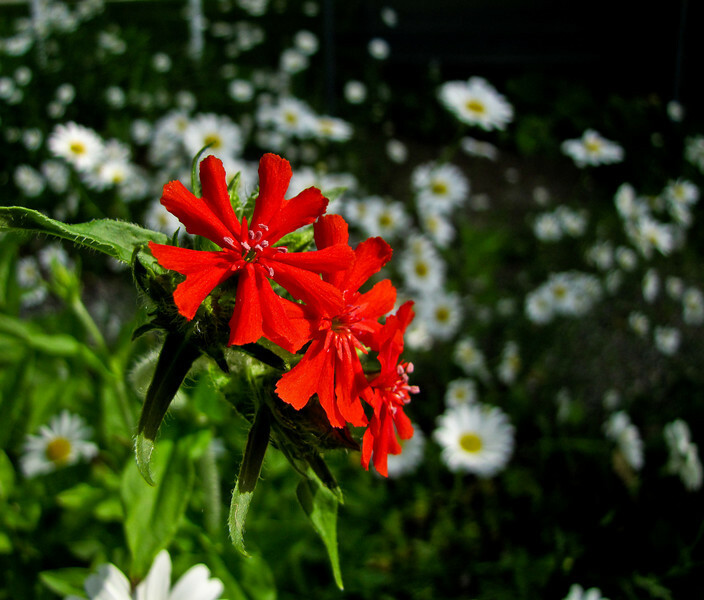 Anther shot from the overgrown flower maze at the University of Machias. Daises and Lupine in abundance. This shot, from an odd angle, low down among the stems, captures some of the riot of blooms. Canon SX20IS at 28mm and Super-macro. F3.5 @ 1/1250th @ ISO 160. Programmed auto. Recovery in Lightroom 3 for the white petals and the sky. Fill Light and Blackpoint just barely right. Added Clarity and just a touch of Vibrance. Sharpen narrow edges preset. 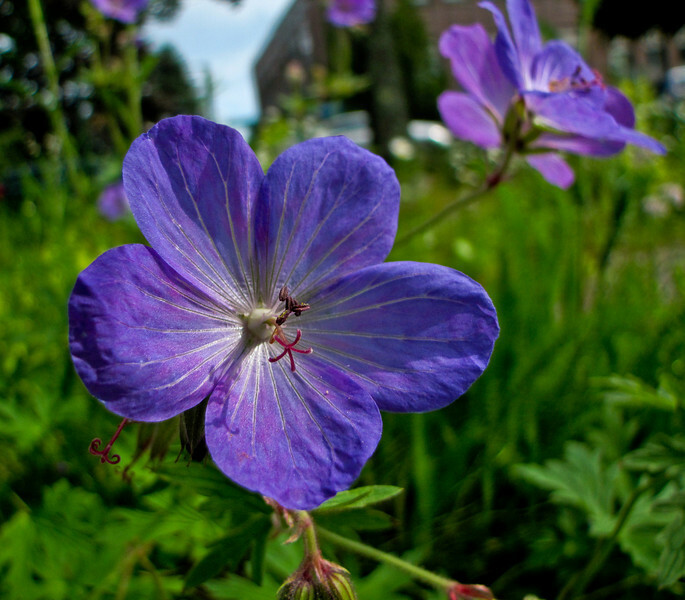 There is a neglected and overgrown flower maze on the campus of University of Maine at Machias, and I spent a happy hour while waiting for my daughter in the garden taking pics. I like the contrast of the red and the out-of-focus daisys in this one, plus the way the light in the background grades into shadow. Canon SX20IS at 28mm and Super-Macro. F2.8 @ 1/1250th @ ISO 80. Programmed auto. Some Recovery in Lighroom 3. A touch of Fill Light and Blackpoint barely right. Added Clarity and just a bit of Vibrance. Sharpen narrow edges preset. Back at last from the land of low bars (AT&T) and no wifi. Better late than never. 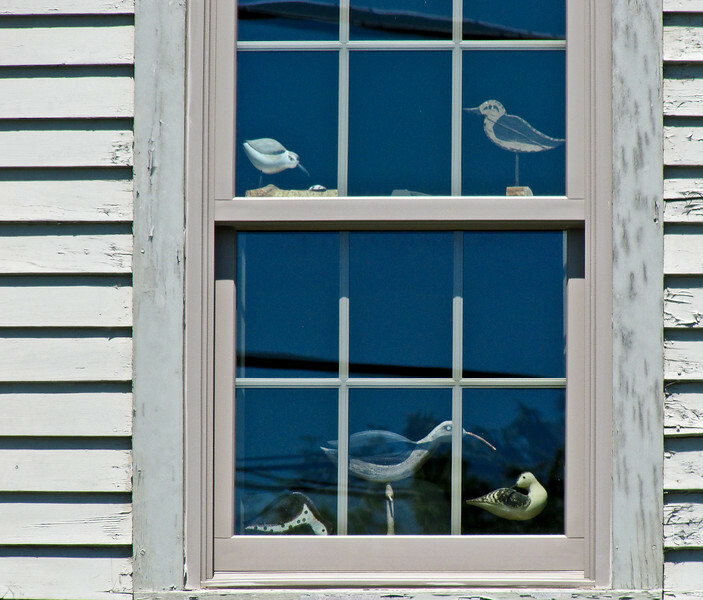 This is another window from the same house as yesterday in Rockport Maine. Some have window blinds…some have window birds. Canon SX20IS at 560mm equivalent. F5.7 @ 1/640th @ ISO 100. Landscape program. A bit of Recovery in Lightroom. Fill Light and Blackpoint just barely right. Added Clarity and just a bit of Vibrance. Sharpen narrow edges preset. Cropped for composition. An interesting old building in Rockport ME on sunny afternoon. 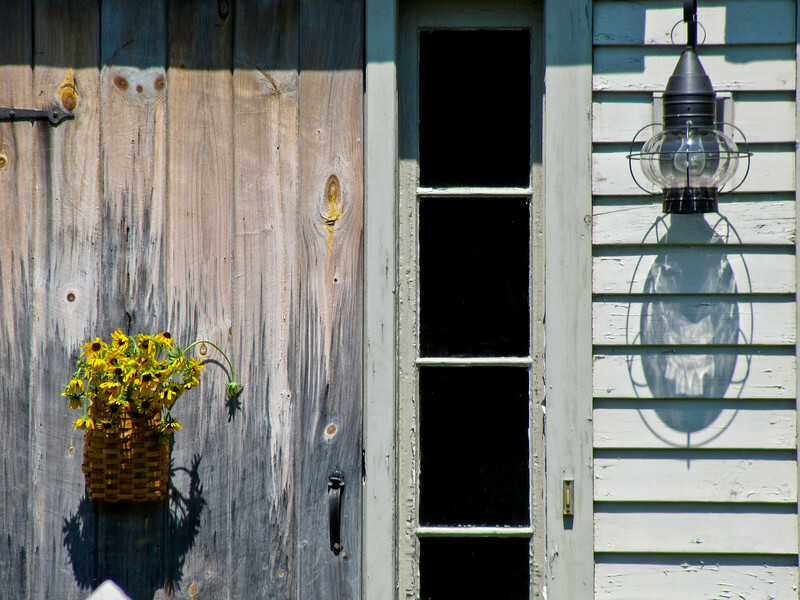 I like the weathered door and what the sun is doing with the shadows, especially of the porch light. I used the long end of the zoom on the Canon SX20IS to frame this snippet from across the street. Canon SX20IS at 560mm equivalent. F5.7 @ 1/640th @ ISO 125. Landscape program. In Lightroom 3, Recovery for highlights. A touch of Fill light and Blackpoint just barely right. Added Clarity and a bit of Vibrance. Sharpen narrow edges preset. A small amount of distortion correction and vertical perspective correction applied using the new tools in Lightroom 3.